People who are trying to do good — with a Green New Deal, for instance, or Medicare for All — regularly find themselves confronting a simple and sometimes sneering gotcha question: So where’s the money coming from? These execs are currently spending incredibly vast sums buying back their own companies’ shares of stock off the open market. In 2018, researchers at Dow Jones report, 444 of America’s top 500 firms spent dollars on stock buybacks. Lots of dollars: $806.4 billion in all, up 55 percent over the year before and up 37 percent over the previous all-time buyback annual record high. These stock buybacks have no redeeming social value. Buybacks don’t make corporations more efficient or effective. They just make the rich richer. Buybacks reduce the volume of shares that trade, in the process upping earnings per share and share value. Who benefits from these upticks? Top corporate execs see an immediate boost. Over 80 percent of their pay comes from stock-based compensation. The wealthy overall benefit, too. America’s top 1 percent, researchers at Goldman Sachs observed earlier this year, now own half of all the nation’s shares of stocks, with nearly 85 percent in the pockets of America’s wealthiest 10 percent. 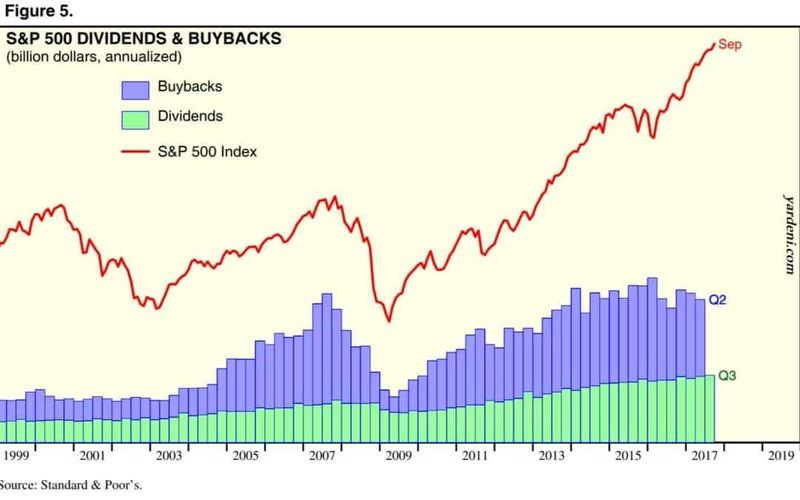 And that brings us back to our original question: Where’s all the money for these buybacks coming from? Corporate America “earned” a good share of that cash the old-fashioned way — by exploiting workers, squeezing consumers, and shunting the cost of cleaning up corporate messes onto the rest of us. Corporate execs also raise multiple millions for buybacks by taking on new debt. But these execs have a plush new source of buyback cash as well: the Trump corporate tax-rate cut enacted in December 2017. The White House promised that corporations would use their savings from this corporate tax cut to create jobs and promote prosperity. Corporations did create prosperity — via buybacks — for the people who run corporations. The rest of the economy, the latest stats seem to indicate, is sinking into a new recession. Back in the middle of the 20th century the pay gap within most all U.S. corporate enterprises never exceeded that 25-to1 ratio. CEOs at major corporations today now average over 350 times their worker pay. In 2017, Bloomberg reports, some 32 major companies paid their top execs over 1,000 times the pay that went to their most typical workers. Senator Tammy Baldwin has an even better idea. She’s just reintroduced her landmark legislation that completely bans open-market stock buybacks. In other words, let’s buy back our future.